Circumferential burn around the mouth and another burn across the anterior chest. Both burns are pink, blistered, blanch to pressure and are painful (superficial dermal). Total body surface area affected 5%. A scald is a type of burn caused by something wet (such as hot water, steam or grease). On average in the UK, 45 children a day are taken to emergency departments with scalds from hot drinks. That’s 16,500 a year! Those most commonly affected are the under 5 yrs age group, who are busy exploring and unaware of the potential dangers. Making pain control the first priority will help calm the upset child and gain control of the situation for further assessment. For those presenting with severe pain, our first line management in the paediatric ED is currently intranasal fentanyl. 2. Has adequate first aid been given? All burns should be run under cold water for 20 minutes. This helps cool the skin and limits secondary tissue damage. 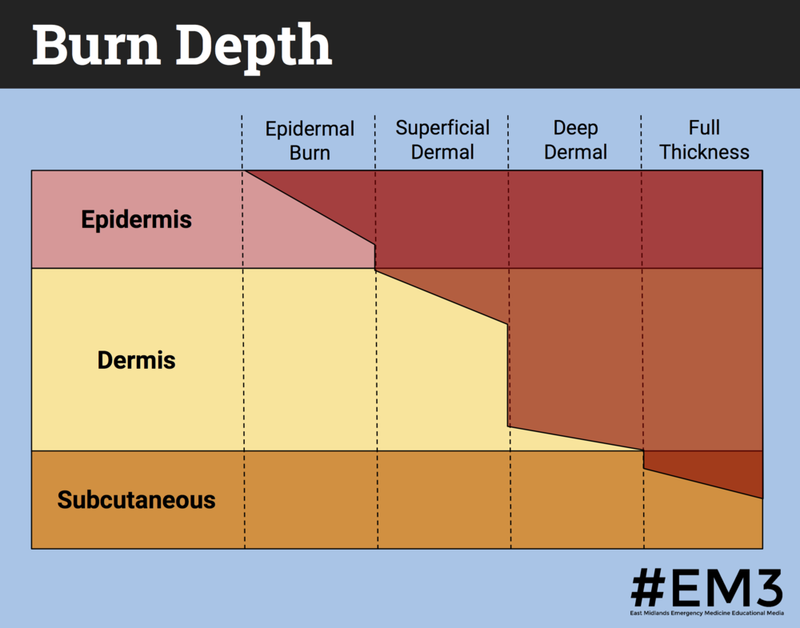 Grading the depth of the burn relies on a clinical assessment of the appearance of the burnt surface, whether there is blanching when pressure is applied and whether sensation is present. Scalds tend to be superficial or partial thickness; being red, sometimes blistered, briskly blanching to pressure and painful when touched. The method we use for estimating burn surface area is using the dimensions of the patient’s hand (where 1 hand = 1% total body surface area.) Practically, this is easiest to achieve if you cut out a rectangle of paper of these dimensions and hold this over the affected area. 4. Does this patient need to be transferred to a burns centre? Reasons for transfer may be the type of burn (such as evidence of inhalation burns or high voltage electrical burns), extent of the burn, involvement of special areas (including the face, hands or perineum), or circumferential burns. Use closed loop communication to avoid misunderstandings and ensure tasks are completed and then fed back to the team leader. Scalds are very painful – in our department we are currently using intranasal fentanyl for severe pain management. Remember to use initial first aid measures to limit further skin damage – running the area under cool water and cover with cling film until further assessment. Signs of clinical shock do not occur acutely with burns, fluid loss is over a number of hours. In the shocked, burnt patient look for other injuries to explain the shock. Demonstrated use of the burns pro forma to calculate depth of the burn and percentage of total body surface area affected. Called for senior support early as recognised lack of experience when managing burns. Alerted anaesthetic team early as recognised potential for airway compromise when secondary swelling at the burn site occurs.